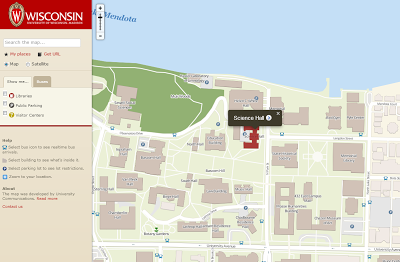 UW-Madison released a new version of their campus map recently. UW has a rich cartographic history with their Cartography Lab being established by Arthur H. Robinson in 1953. Successive Faculty and students have become renowned for the high quality of their work and have helped shape cartography as a subject and as a practice in the subsequent years. Their campus map has always been a work of high-quality cartographic design. Their web site hosts an archive of past maps that showcase the shifts in design through the years. Apart from a period in the mid-seventies and the most recent 2006 version when they reverted to planimetric form, the maps have been constructed using a 3D axonometric approach. 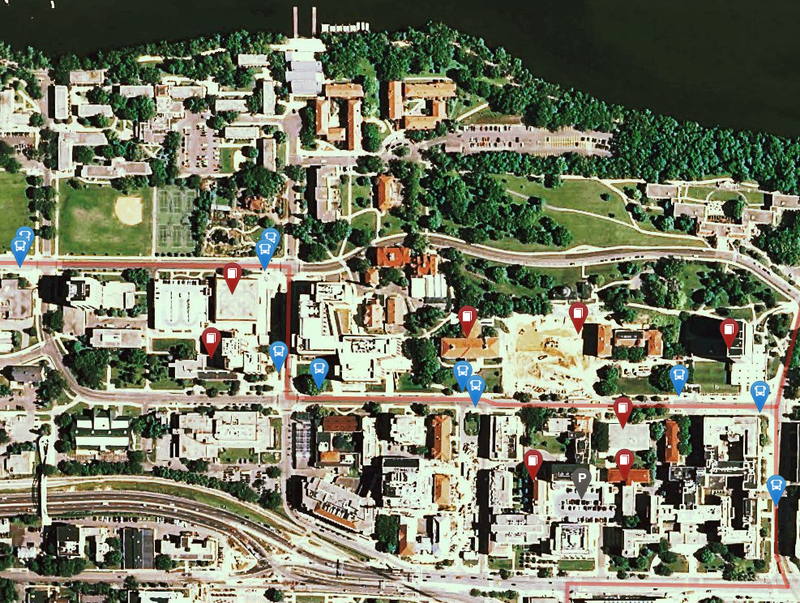 This is a common approach for University campus maps because it allows individual buildings to be represented as they appear. This works well for this type of large-scale map that needs to show the form of a dense urban environment to aid location and navigation. This sort of approach was well used by Bollman in 1962 and, later by Anderson in 1985 in their highly detailed, famous maps of Manhattan Island. By allowing people to see their environment in detail, the maps support a more immediate way of linking what they are looking at in the real-world with the map that provides the description. They also exhibit a strong aesthetic. The 2006 version was also a beautiful and well-designed map and the drop shadow on buildings lifts them off the detailed basemap. On this version, the basemap is the key to the detail with individual trees and land cover shown to provide the context. So what of the new map? Well it's a now a web map which is inevitable as the new publishing paradigm for mapping. Nothing wrong with that per se. It replaces a previous Flash-based online version, presumably to ensure that students with iProducts can use it. 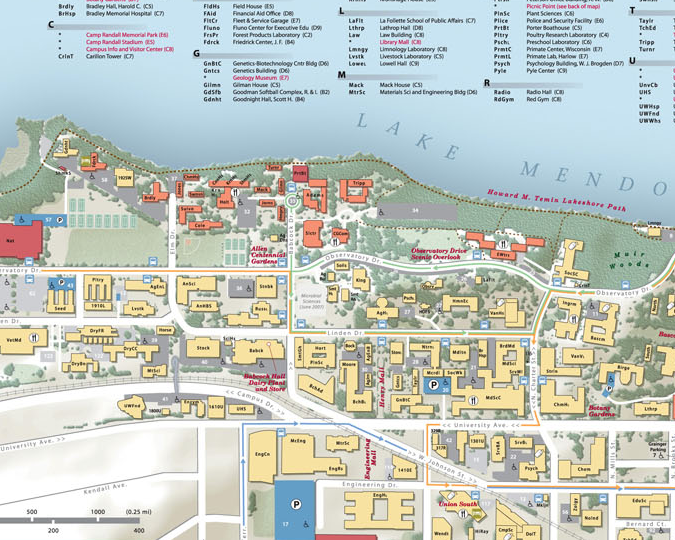 The map has been "developed by University Communications and Marketing" and authored by their web developers with advice from cartographers. When you click "About the map" you get a roll-call of tools and software used to build the map. JOSM this, Mapnik that, Ruby on Rails blah blah yackity schmakity. Maps never used to have a huge list of the different sized Rotring pens used, or whether it was built using Illustrator or Freehand did they? 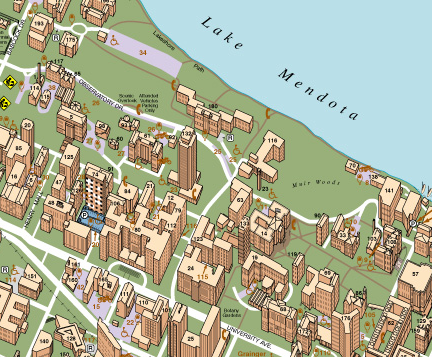 None of the previous UW campus maps have this detail...the maps speak for themselves. Mode of production should be irrelevant but smacks of an attempt to show how clever the map is when presented like this. Instead, we could have had a description of what the map is showing, what the design philosophy is and how choices of representation are expressed. Alarm bells ring...this is an example of treating the map as a technical challenge and solution rather than a cartographic one. It's really not that important how the map was built...what is important is the map does its job and does it well. The map itself relies on an OpenStreetMap derived slippy map. Gone is the local detail. Gone is the immediacy of the axonometric projection. Gone is the colouring by building function that the 2006 version used. Gone is the cartographic nuance and polish that brings a large-scale local environment to life. The map is bereft of detail. The buildings are merely flat shapes on a flatland that lacks detail. The argument of showing detail through the satellite basemap will undoubtedly be made but that, of course, includes all manner of extraneous detail because it lacks generalization. The map now becomes nothing more than a portal to other information via popups. Yes we get pictures of the buildings but have we made progress when it takes 2 clicks to get that picture when some of the previous maps had them built into the design itself. You can add libraries, public parking and visitor centers which appear as huge markers. Again, a well designed map would have these integrated into the design. The map is not much more than a collation of data sources that lacks a coherent design strategy. 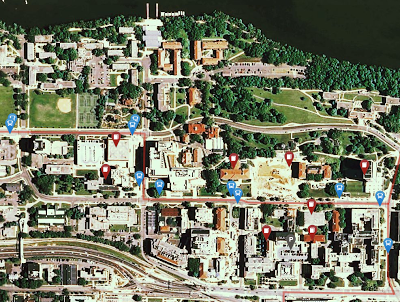 A brief Twitter conversation with one of the UW web developers illustrated that the desire is there to make a better cartographic product but that the technology and resources were a limiting factor. So it begs the question...why replace a perfectly good map if the replacement isn't going to be capable of being an improvement. Change for changes sake. Yes, the map is searchable and rollovers give us other detail. The bones of a decent map are here but it lacks the quality of the previous maps. As a first iteration there is undoubtedly room for improvement but here is the main problem... UW-Madison is renowned for high quality Cartography. Web sites are a public facing demonstration of the University, they are a highly visible window into the quality they purport to offer but the web map does nothing to demonstrate that quality so visitors to the site leave unimpressed. If the web site itself does not match the quality of what the University offers then it detracts. The same is true of many many other institutions. How often do we see a sub-par map published by a Marketing department which has been developed by people lacking in the cartographic expertise to do the job properly? Kingston University are hideously guilty of this as I well know from my previous job. Their awful maps are still being used despite in-house cartographic expertise and student work providing a much higher quality product. 'Official' Kingston University Campus Map...still one of the worst examples! This problem isn't just seen in Universities. Many organisations push out maps that fail to do justice to the quality of their other work or provision. Many have expert map-makers yet the work given the most visibility is often built by others. Good maps are a combination of domain knowledge, cartographic expertise and technology. Web maps are becoming the de facto standard but they need more than just web development. They need cartographers with web development abilities; they yearn for design; and they need a symbiosis of skills to realize a truly high quality product. It's no good cartographers moaning about poor web maps if they aren't willing to step up to changing technologies. likewise, those with web development skills shouldn't assume they have the necessary cartographic skills to do the job. Currently, web maps are limited by the technology, or, more accurately, by such fast-moving technological change that maturity and stability is still hugely disruptive which leaves many projects either experimental or limited. If web maps are going to improve then people with design skills need to be heard so that the technology can be built to support good design.